JOINT ACTION COMMITTEE - Emergency committee formed in San Francisco, CA, May 5, 2008 in response to Cyclone Nargis that devastated Burma on May 3. 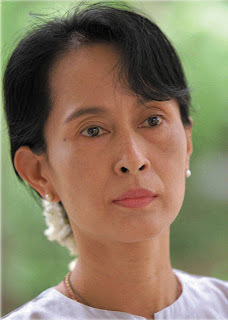 Aung San Suu Kyi is a national hero in the fight for a free Burma and a symbol of hope in the downtrodden country. In 1991, she was awarded the Nobel Peace Prize "for her non-violent struggle for democracy and human rights" and became an international symbol of peaceful resistance and courage in the face of hardship and oppression. In 1990, she was put under house arrest by the government and remains there to this day. ►BURMESE FOOD WILL BE SERVED. 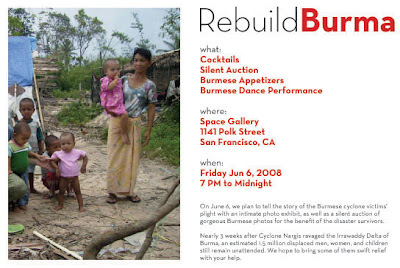 On June 6, we plan to tell the story of the Burmese cyclone victims’ plight with an intimate photo exhibit, as well as a silent auction of gorgeous Burmese photos for the benefit of the disaster survivors.